Corsair has outdone themselves with the Strafe mechanical gaming keyboard as both its quality and performance are top notch. Even better, it's $109.99 suggested retail price make it both a perfect introduction to first time mechanical keyboard users and those looking to upgrade from an aging keyboard. While it might not contain all of the features of other more expensive keyboards, the ones included make it a compelling package. The model I received for review contained Cherry MX Red mechanical switches, which was a first for me after having previously used Brown and the custom Razer type. While it might be described as a gaming keyboard, the aesthetics don't go overboard in any particular area. It's sleek profile and black matte exterior combine for a minimalist design that makes it fit well on nearly on any desk or surface. The keyboard's red LED backlight is overly bright at its max setting, but can be toggled to various brightness levels for a dimmed look. The top right of the keyboard has single bar LED indicator lines that give the keyboard a modern and elegant look. 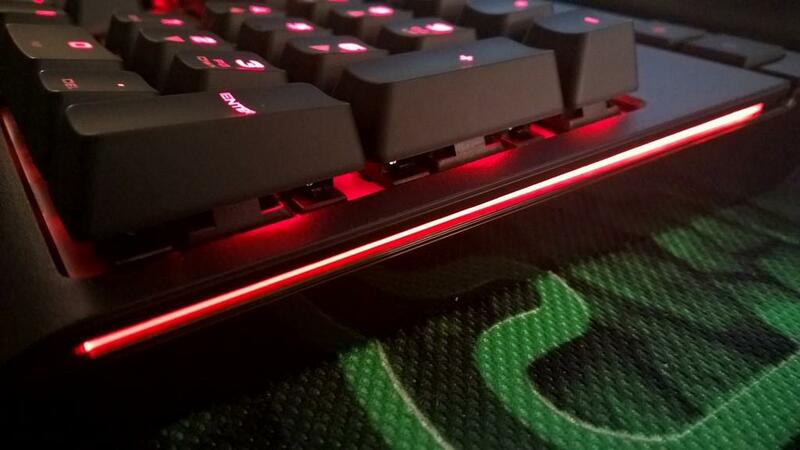 The sides of the keyboard have red LED lighting strips that while unnecessary do add a welcome touch of visual flair to the overall aesthetics. They keycaps feature letters that are vibrant and clear with strong, bold lettering. 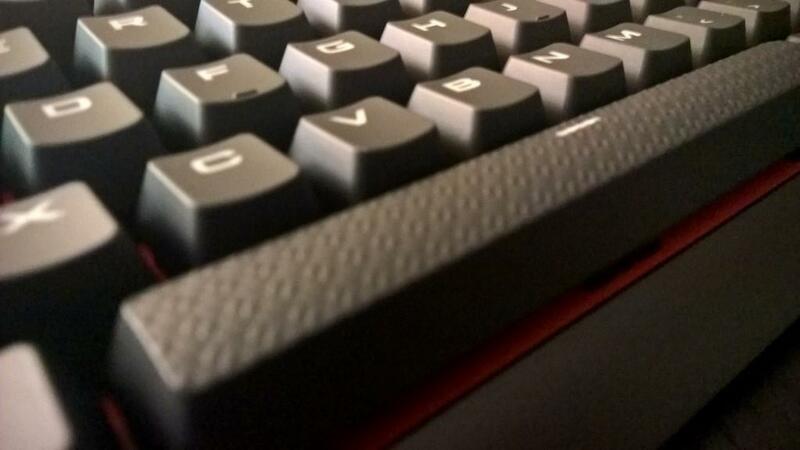 The spacebar has a textured surface making it more accessible for gaming and typing in general. One particular feature that made an instant difference during my time spent gaming was the inclusion of interchangeable textured and contoured WASD keycaps. 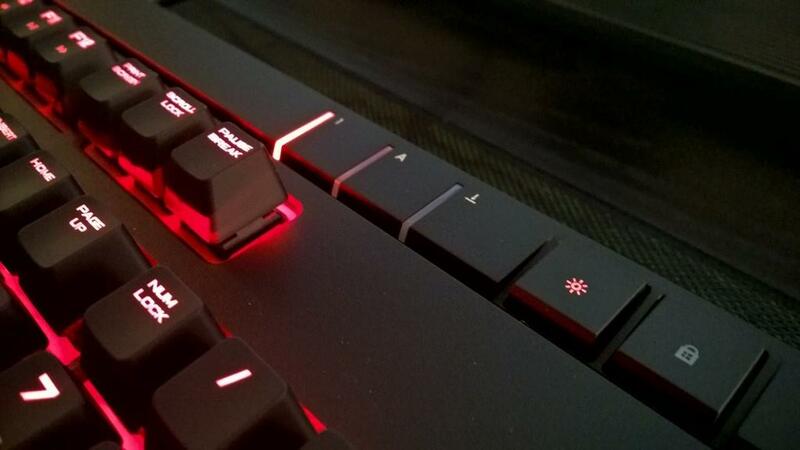 These included keycaps are designed for first-person shooters and MOBA games, but in fact help with any games that utilize the WASD keys. My favorite aspect of the keyboard is the extremely satisfying tactile touch when typing and gaming. Typing in particular with the Cherry MX Red mechanical switches offer great tactile and auditory feedback. If you've previously only used Brown or other mechanical switches then I highly recommend you to give the Red keycaps a try. In regards to build quality, the keyboard feels sturdy and doesn't show any hints of flex in its construction. The mechanical keys in particular are well made and didn't provide any issues during my time with the keyboard. There wasn't any issues either with inconsistent key presses or odd performance in general, everything worked perfectly. The only element that I had to get used to was with how the Red mechanical switches function in comparison with other keycaps. Red mechanical switches are far easier to activate because of their low resistance, which did result in some accidental key presses but nothing that wasn't resolved relatively soon from getting used to it. 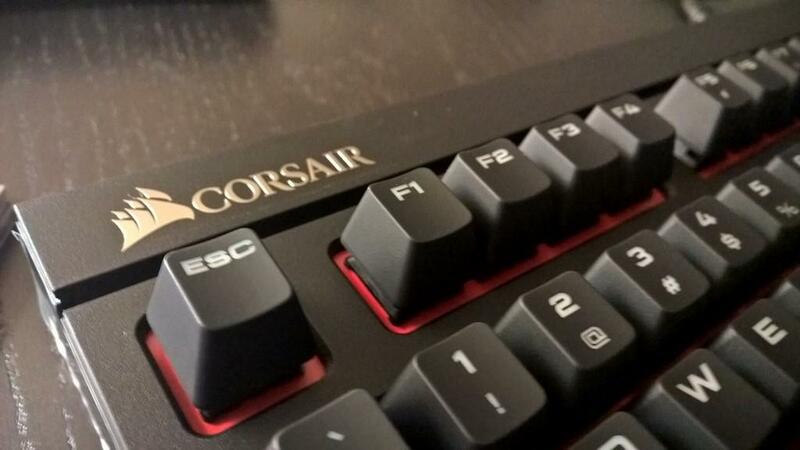 Users that wish to customize the keyboard in regards to macros, backlighting, and other elements can download the Corsair Utility Engine (CUE). The software allows for extensive customization ranging from special lighting effects to remapping function keys. While the software was a bit complex in some areas that seemed as if they should have required less steps, the overall customization is nearly unlimited of what users can do with the Strafe. 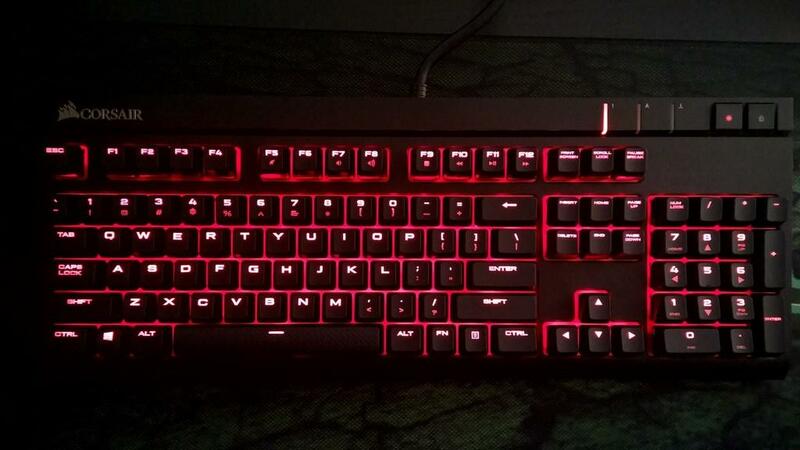 While the red LED of the backlighting can't be switched to other colors, each key can be customized in regards to their lighting brightness and effect and of course its function. Other features include media control function keys, 100% anti-ghosting, onboard memory to save settings, a USB pass-through port, and key switcher tool for swapping the textured and contoured WASD keycaps. It's also worth noting that keyboard contains a two year warranty, which if past Corsair quality is any indicator users shouldn't have to worry about any long term issues. While the Strafe might not have all the advanced features and complete LED coloring as more expensive keyboards, it contains a compelling set of elements that combine to make one of the best keyboards I've used in awhile. Both its affordable price of high build quality and performance make the Corsair Strafe a perfect purchase for those looking to purchase their first mechanical keyboard. Even those looking to upgrade an aging mechanical keyboard shouldn't overlook the Strafe either as it will keep your wallet happy with its outstanding value. The Corsair Strafe mechanical gaming keyboard provides a compelling package of features all the while selling for an affordable price. 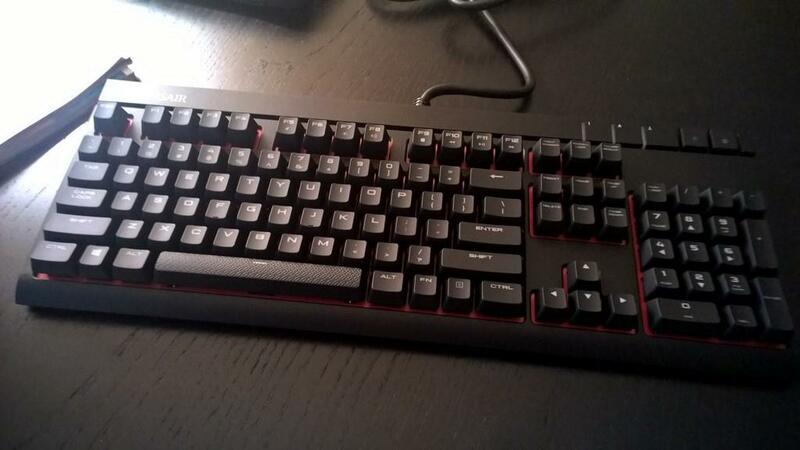 The Strafe is perfect for both newcomers to mechanical switches and those looking to replace their aging keyboard. 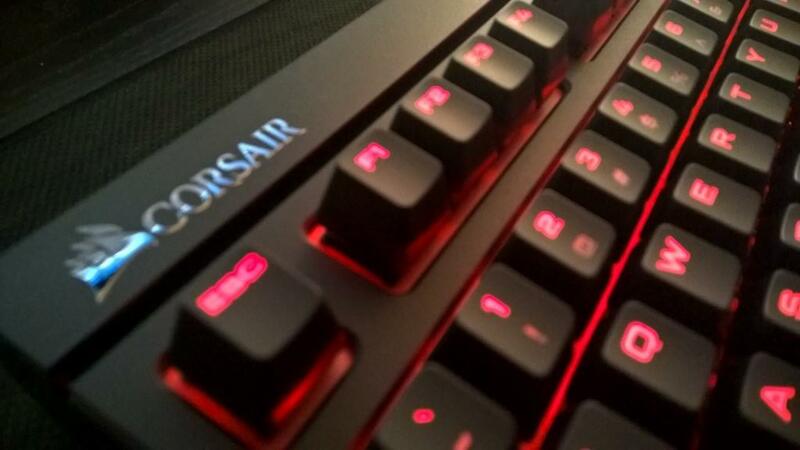 High build quality and performance and outstanding value earn the Corsair Strafe a strong recommendation.